Description: This is a wonderful Pastel Pop Alphabet set from Hero Arts. You get all 26 letters as well as a Shadow Box and a Flower stamp. All letters have the shadowy background and will look fabulous on anything!! This set is a must have for any scrapbooker as well. Size: Each stamps is 3/4" x 3/4"
Description: This stamp set is made by Hero Arts. This great Alphabet set can be used for any stamping project or for scrapbooking! Get the matching lowercase set too!! This set has the 26 Capital Letters and 4 Marking Stamps. Size: Each stamp is 1/2" x 1/2"
Description: This stamp set is made by Hero Arts. This great Alphabet set can be used for any stamping project or for scrapbooking! Get the matching uppercase set too!! This set has the 26 Lowercase Letters and 4 Marking Stamps. Description: This is a stamp set from Hero Arts that is Alphabet Blocks in Mini size. GREAT for so many things including all your scrapbooking ideas. You get the 26 letters of the alphabet and then 4 extra stamps including a blank solid square, and these: ?, !, and &. Description: From Hero Arts comes this Alphabet set of stamps called: Circle Pop Alphabet. You get 28 total stamps: 26 letters, the "&" sign and a small shadow circle stamp. Size: Each stamp is 3/4" x 3/4"
Description: From Hero Arts comes this Alphabet set of stamps called: Circle Uppercase Alphabet. You get 28 total stamps: 26 letters, a small shadow circle stamp and a small circle stamp with polka dots around it. 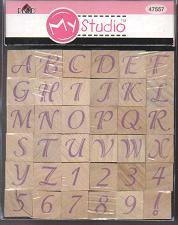 Description: This is a uniqe set of wood alphabet stamps from All Night Media. Capital letters and numbers all in script. Perfect size for scrapbooking! Size: Each letter is 1/2" X 1/2"